Johnny Cash - American VI - out now. Earlier in the week one of my nieces had a bash falling down a few stairs at home, and staved her finger. My English wife had never heard of "stave" before - and I must admit I had difficulty explaining it to her. So I dug out my copy of The Hamely Tongue and there it was - the definition is "to injure the joints of a finger or thumb by stubbing". Chambers English Dictionary confirms that "stave" is Scots in origin. Folk might huff and puff about language and status but there is no doubt whatsoever about the large amount of Scots-origin vocabulary in daily use in Ulster today. Woburn House, on the big sweeping beaches just south of Millisle, was built by the wealthy Belfast businessman John Gilmore Dunbar some time between 1797 and 1830 as his summer residence. I am 99% sure that his family had come from Scotland. Like many of his ilk, big fancy houses along the County Down coast (many of which are still dotted right along the shore from Holywood on down the Peninsula) were the ultimate status symbol. The town of Dunbar is a town between Edinburgh and Berwick on the east coast of Scotland, which was the location of a famous battle involving the Covenanters in 1650. For most of my life the house has been used as a borstal. You'd think that a more suitable purpose could be found for such a fine building. (NB: If you're reading this on Facebook, the original post is from my blog) Took this photo yesterday - Burial Isle is just off Ballyhalbert, the most easterly point in Northern Ireland. There's a legend that it has a secret Danish burial chamber full of Viking treasure - if you could find it under the guano! 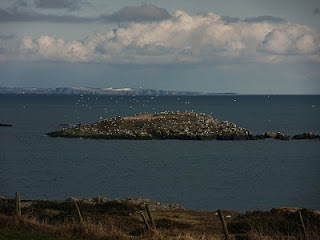 The land in the foreground is mainland Ulster, then Burial Isle, with a snowy Mull of Galloway in Scotland on the horizon. Click to enlarge. The Blackwoods were one of the first Ulster-Scots families, arriving at Bangor around the time of the Hamilton & Montgomery settlement which began in May 1606. John Blackwood (1591 - 1663) was born in Fife and became Provost of Bangor; I'm fairly sure that his father was Adam Blackwood. Clandeboye Estate is on the site of the Blackwoods' original dwelling. A wonderful iconic building which Mark Anderson blogged about recently, and which has a fascinating social history too. "...about 1636 the coming and going of Scots and Irish* between their respective countries was on a scale that made it a remarkable feature of the time... so numerous were the bodies of Scots passing through Irvine for Ireland at this period that the Earl of Strafford... was compelled to insist on every Scot who arrived in Ireland bringing with him a certificate of his respectability and honest intentions... no fewer than 10,000 Scots from the country between Aberdeen and Inverness had crossed to Ireland within two years... they came in parties of one hundred in number at a time through Irvine... three hundred had shipped for Ireland at one tide. The reason was that the country had suffered a series of bad harvests which reduced a large proportion of the people to beggary and drove many to emigrate to the north of Ireland to contribute by their thrift and energy to the prosperity of modern Ulster..."
This late 1630s migration is a new one to me, and warrants further research. Significantly, this part of Scotland, whilst northerly, is still mostly Lowlands and in the 1630s was very Presbyterian - the book "The Covenanters in Moray and Ross" by M MacDonald (Inverness 1892) provides some brilliant detail and insight into the area at exactly the time of this migration. From 1605 - 1613, and then 1622 - 1624, the renowned Robert Bruce of Kinnaird had been banished to Inverness by King James (his published Life and Sermons are here). Bruce was a preaching tornado and massive spiritual conversions took place across the whole region. By the time that Scotland's National Covenant arrived there in 1638 "...the people of Sutherland, Easter Ross, Nairn and Moray entered into the Covenant with alacrity...". To bring the connections up to the present day, Billy also tells me that he was born in a part of Irvine which was then known as "Wee Ulster", such were the huge numbers of Ulster families living there and working in the shipyards of Ayrshire. * NB - I suggest that the term "Irish" here is geographical, rather than linguistic or cultural, and refers to people who were Ulster-Scots. “It is a great pity men know not to what end they were born into this world, until they are ready to go out of it"
The Hardy Brothers - a Scotch-Irish Argentinian sugar empire. (NB: If you're reading this on Facebook, the original post is from my blog) I have an old book with a modest title: "The Scotch Irish in History as master builders of Empires, States, Churches, Schools and Christian Civilization" by Rev James Shaw, published in Illinois in 1899. "...(Hardy) was one of those hard-bitten, tenacious men that Antrim rears, with all the dogged obstinacy of the Scotch and the intelligence of the Irish, whom you find struggling and prospering throughout the seven seas. His father kept a small draper's shop in Ballymena, but it could not hold the wanderer and his dreams. After a spell in Australia, he came to Buenos Aires, where he started a small dry goods store, made money selling Belfast linen, and married a native lady. Then he became an estanciero, and in the end sold his shop and fenced lands to stake his whole fortune on the development of the sugar and tannin business in the wild Chaco. It took a brave man to create this oasis of industry in the heart of the jungle, but he did it..."
"...It was about the year 1874 that Messrs. Hardy Brothers, of Belfast, established the importing firm of Hardy & Co., in Buenos Aires; the late Mr. Richard Hardy was the head of the firm, and the business grew so fast that they found themselves in a very short time at the head of a large trade in Irish linen and hessians. The finest linens from Ireland were introduced into this market by the firm and found a splendid sale, and the sugar business, which was then in its infancy and creeping up, generated a demand for bagging which Messrs. Hardy & Co. for many years supplied. No merchant in Buenos Aires watched the market more keenly or studied the currents of trade more closely than Mr. Hardy ; he saw the tendency of the country to protective customhouse duties, and with a zeal deserving a better result he was the first to start flax growing in the Plate and literally spent a thousand pounds on an experimental flax farm in Quilmes. He brought out the best machinery, scutched the flax here and spun the Argentine yarn in Ireland; but one way or another the result was not favorable; he then turned his mind to the manufacture of hosiery and under-clothing, introduced the best machinery and all those great and important manufactories of stockings and undershirts which exist in the city to-day were founded and introduced by Mr. Hardy. He traveled over the country in every direction, studying its adaptabilities and requirements; he visited Tucuman and was in and out through every sugar factory in that province; he traveled over Entre lUos and Corrientes. It was a period remarkable for what is termed concession fever; everyone was taking out concessions, and Mr. Hardy followed the current, visited the Gran Chaco and took out a concession in the year 1880 to start a sugar plantation and factory at Cerrito, which is beautifully situated at the confluence of the three rivers: Parana, Upper Parana and Paraguay ; and here he made his first start in sugar planting, with such unlooked for success that he soon discovered the area of arable land for the planting of sugar cane was too limited for his views... He at once applied to the government and under the terms of the land laws received a territory of four hundred square miles, and it is on this magnificent territory that he constructed the factory and built up the establishment which we now visit. The Messrs. Hardy's sugar establishment at Las Palmas, in the Chaco Austral, is the largest, the grandest and most successful of all the sugar plantations in the Chaco ...the Hardy sugar factory of Las Palmas is paved with sovereigns, from the port to the factory, from the factory to the Indian village of Cancha Larga, from the colonies still further out, back to Mr. Hardy's bouse; in every field, in every Indian path, in every "senda" we see the impress of the gold sovereign..."
"Belfast and the Province of Ulster in the 20th Century" (Pike, 1909) records two men called Hardy, but they seem to be of a different family than the above. There's a brief biography online here. If anyone out there knows more, please get in touch. "Soda Farls and Redemption Songs" - our new CD is on the way! (NB: If you're reading this on Facebook, the original post is from our music blog) Yes, the long-awaited CD is nearly finished and all being well will be out before Easter. It's named after two things that we grew up with - Soda Farls & Redemption Songs (Hairtsome Hymns fae oor Ulster-Scots childhood). There should be around 18 tracks, mostly old hymns with clear Ulster roots, some "Sacred Scotch Solos" and some old brother duet songs from the 20s and 30s. Lots of people from all over the country have been asking us about the CD over recent months, so if you email us we'll put you on a list - and you'll be the first to know when it arrives. Spread the word and get the kettle on - it's on the way! (NB: If you're reading this on Facebook, the original post is from my blog) So here we are, another momentous agreement. But sadly the "hand of history" was missing, I hoped he/she might have showed up, as he/she would have had a story to tell. Because exactly 800 years ago King John arrived in Ireland. He had been here back in 1185, but this was his first visit as King. He arrived at Waterford on 20 June 1210 and while he was here spent a fair bit of time at Carrickfergus. During the visit, John granted land at Larne and Glenarm to a Scottish "ruler of greater Galloway, Duncan of Carrick". Here's an excellent article on the subject. So in 1210 there was a big historic event (after which, in 1215, King John issued the Magna Carta); then 400 years later in 1610 along came another one in the form of the official Plantation of Ulster - and now, another 400 years later in 2010 there are yet more big things happening. Now that the deal's been done, maybe the papers and airwaves will find something different to talk about. (NB: If you're reading this on Facebook, the original post is from my blog) The Hamilton Manuscripts record a man called James Traill of Tullykin (1595 - 1663). 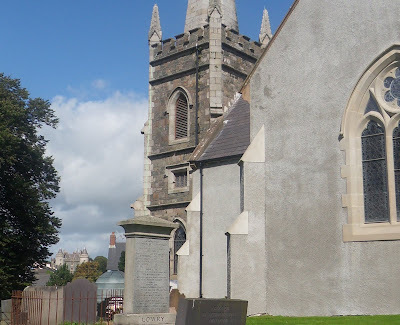 There are lots of different spellings of the place, like Tallachin / Tolychin / Tullochin / Tullychin, and the name lives on today - there's a Tullykin Road just outside Killyleagh. He was born in Scotland (probably Blebo in Fife, just 5 miles from St Andrews) on 15 October 1595. His brother Robert Traill (1603 - 1676) was the famous minister at Greyfriars Kirk in Edinburgh. Here's an article about the family, called "The Covenanting Traills", some of which is in Scots. According to the article another member of the family, Colonel James Traill (possibly Robert and James' father) acquired 1000 acres in Knockninny in Co Fermanagh during the Plantation. The other major grantees in Knockninny were the Balfour brothers - second cousins of the Traills - who built Castle Balfour in Lisnaskea around 1620 (pic shown here, click to enlarge). James Traill was no dozer. He had a degree in theology from Leiden University in the Netherlands, and spent time with the Ambassador to Paris. Robert Traill too was in France, joining James there in 1625 and staying until around 1630 - he was later described as a "Grim Geneva Minister". Around 1633, Sir James Hamilton appointed Traill "...He choosed for him a very learned, discreet, and religious master, one Mr. James Trail..." to be tutor for his son. The son was "...to travel some years for his improvement, which he did the length of Rome, very safely and successfully, and returned with great improvements in such things whereunto his genius allowed..."
So James Traill showed young Hamilton jr, the ways of continental life. Traill wrote to Hamilton sr. from Paris in October 1633, summarising their trek around France. It wasn't a holiday - the letter says that young Hamilton started his day at 7am with two hours study of French or Latin, then classes in dancing and fencing, then oral French, followed by an hour of translation. Once he had a grasp of French he was going to move on to study "logic and mathematics". At the start of the day and at the end were his "duties of piety". Traill went on to outline a proposed "circuit of France", plus a trip to Geneva and Italy - Florence and Rome in particular. When they came back, Traill joined Oliver Cromwell's army and rose to Lieutenant Colonel. It's not very PC, but Cromwell said of him "If only I had 10,000 James Traills, I would drive the Pope out of Italy" - a country that Traill was already very familiar with! Traill married Mary Hamilton (daughter of James Hamilton's brother John - and therefore a cousin of Hamilton jr.) in 1647. However in 1649 James Traill had to leave Ulster "...on account of malignants..." and went to stay with his brother Robert in Edinburgh. Robert also knew the Hamiltons well - he and Rev James Hamilton (who was another cousin of Hamilton jr.) were both ministers in Edinburgh and signed the Solemn League and Covenant together on 11 April that same year. They also both accompanied their friend and coleague James Guthrie to the gallows in 1661 when he was executed by order of King Charles II. "Heere lyeth the body of Lef. Col. Jam(es) Traille who having severall years faithfully served his mast. in ye warr against ye Irish Rebells departed th(is) life at Tollachin 18 May 1663, haveing had issue by his wife Mary Traille als Hamilton, daughter to John Hamilton of Hamiltons Baun in ye county of Ardmagh, Esqr., broth(er) to ye Right Honl. ye Lord Viscount Claneboys; 4 sons & 8 daughters, James, John, Hans, James, Jane, Ann, Mar(y), Mathelda, Sarah, Ellenor, Magdalen, Margaret. Here lieth the body of Elizabeth Trail alias Read of Hollypark who departed this life 10 Jan 1818. And also near to this lies the remains of her husband, the Revd. Archibald Hamilton Trail of Hollypark, Killinchy, who departed this life 16 Apr 1844 in the 89th year of his age." There's a humourous, but derogatory, stereotype where the first generation of Ulster-Scots settlers are dismissed as "sheep stealers and cattle thieves" or (to use an often-abused mid 17th century source, Rev Andrew Stewart of Donaghadee, who wrote about the settlers from England and Scotland) "the scum of both nations". These might be amusing, but they're very far from the whole story. James Traill is a perfect example of a sophisticated Europhile who was as comfortable in his youth with the Ambassador in Paris as he was in later life in his wee townland outside Killyleagh in County Down. And if you've got a spare £375,000, there's a very nice house for sale at Tullykin right now!